Get Hundreds of Free Workers AND an Abundant Harvest! 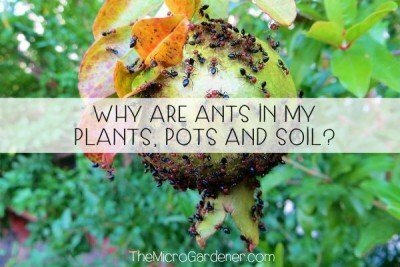 Want less pests in your garden? To help achieve balance between pests and predators, I’ve found that imitating natural ecosystems can be a useful pest management strategy to use. 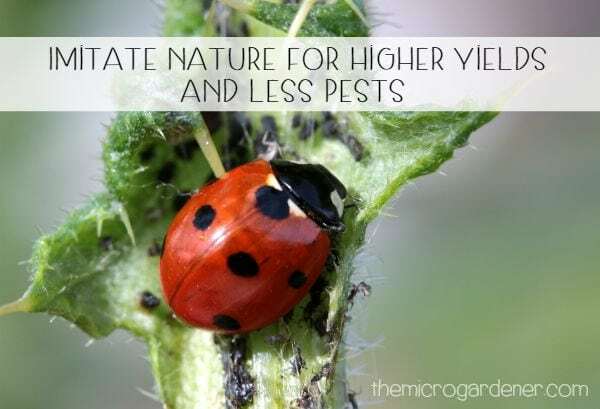 Facilitating natural predator-pest relationships in your garden is a way to harness hundreds of free workers to help manage insect imbalances. 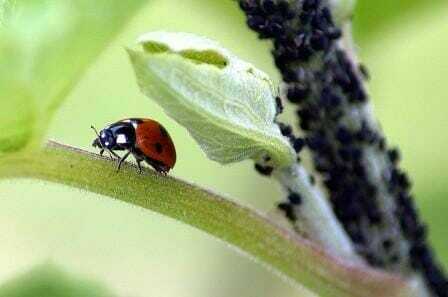 An example is the ‘aphid banquet’ on the menu for this ladybird’s lunch! Minimise insect damage to your edibles (by creating an unwritten ‘Workplace Agreement’ of sorts with Pest Predators – one that offers the kind of job perks that are an incentive for them to get to work in your garden)! I’ve learned the benefits of ’employing’ hundreds of workers in my garden. Even though I don’t know them all by name, they still turn up regularly for work, never ask for a raise, are reliable in undertaking their jobs and save me hours of hard labour. In this post, I’ll share with you what my end of the agreement entails and how you can negotiate a similar arrangement at your place. A garden free from herbicides & other chemicals is not only healthier for you, but creates a safe environment to grow food and for insects & other creatures to take up residence. The soil is often disturbed by digging, transplanting, uprooting and weeding. Vegetables and plants are grown in neat rows or beds. We often sow seeds and plants that are not native to the climate. We often have to deal with introduced pests and insects that can thrive, where they have little natural competition or predators. Whereas in undisturbed natural environments like on a forest floor, incredible plant diversity abounds! There are no straight lines, rows of identical plants and rarely any major pest problems. Only plants that are native to the area grow there, fed by a healthy soil that has not been depleted – one that is fed by the ecosystem it is part of. 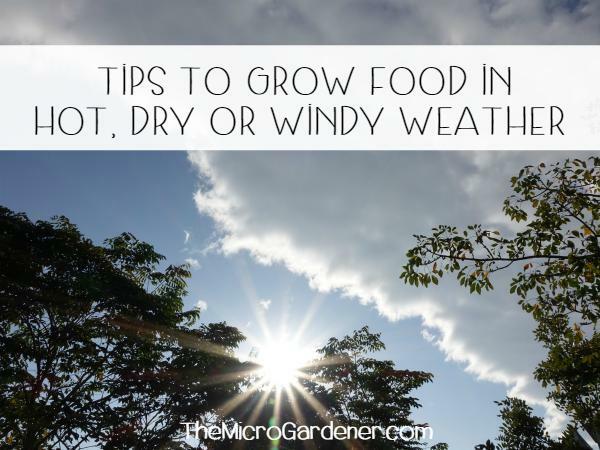 Leaves, sticks, dead plants and animals, fungi and bacteria all on the ground – decaying and returning nutrients back into the soil for new plants to thrive and grow. So wherever possible, I try to learn from and imitate natural systems in my own garden environment. Both in my micro gardens (pots and containers) and raised beds. 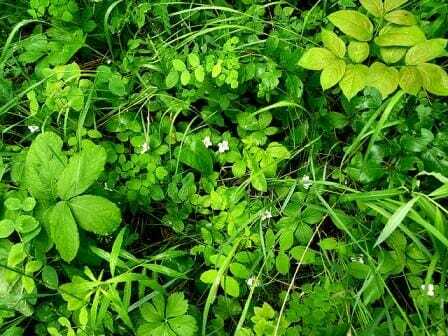 For example, in nature, there are a mix of naturally occurring species of plants in every ecosystem. 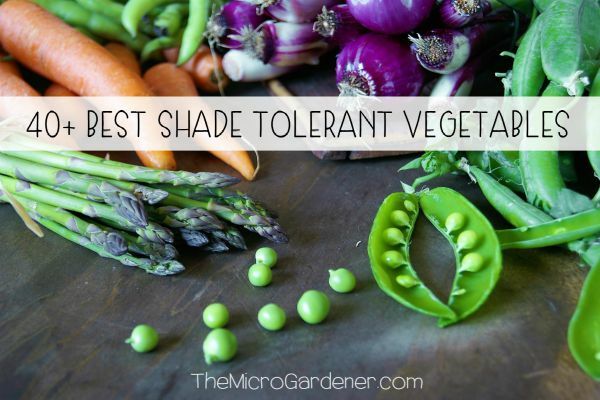 Each with different soil and mineral needs, and various shapes and sizes. 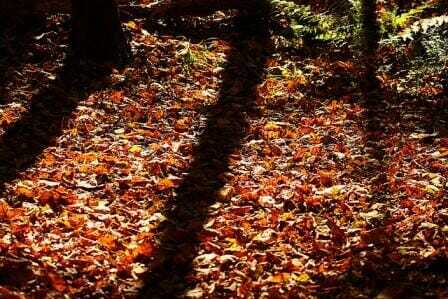 Often in layers, like in a forest, from the top canopy right down to the ground floor. This is easily applied by planting a variety of edibles of different heights and shapes. David Holmgren, Co-Originator of the Permaculture concept said: “All organisms and species obtain a yield from their environment adequate to sustain them.” This is a Permaculture principle and model from nature we can apply. So how can this help you to have less pests to deal with? You can change your pest management strategies for more abundant harvests and less work. Another lesson we can draw from Permaculture involves not seeing the Problem, but the Solution. So instead of focusing on our food being consumed by caterpillars or grasshoppers, we think instead about where the natural living control solution lies. 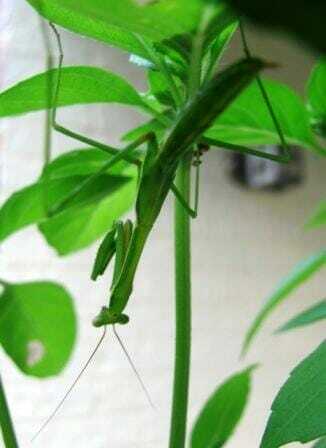 More often than not, nature’s balance can be restored by increasing the ratio of predators to pests. Bill Mollison, one of the fathers of Permaculture, said “You don’t have a snail problem, you have a duck deficiency!” So if your aphids are out of control, you need more ladybirds not a spray bottle. Encourage Predator Insects to Manage Pests for You. Beneficial predators are amongst the best allies and visitors to woo into your garden. This army of pest patrollers will exterminate and maintain balance far better than we can. On one condition. So long as you keep your garden chemical free. Here’s where this ‘Workplace Agreement’ comes in! When you understand what these hard working ’employees’ (insects, birds, frogs and lizards) are looking for in their ‘place of employment’ (your garden), you can tailor an attractive package (job perks) that will ensure they are fully employed for their lifetime (food source). Their position is Hitman (or Woman) and their basic job description is to assassinate (eat their favourite food – what a great bonus)! 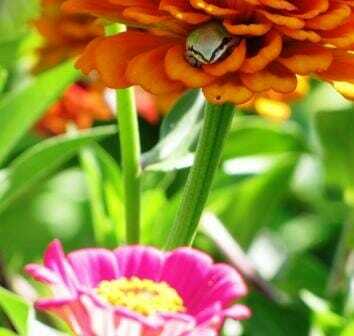 This clever tree frog selected a perch in the shady petals of a flower and patiently waits for his prey. All you have to do in return is organise suitable accommodation, regular drinks and the occasional feed. Oh, and don’t forget OH&S (a safe working environment with no chemicals). I reckon it’s a bargain arrangement! Praying mantids: Insects such as praying mantids are fearless carnivorous hunters and will delightedly feast on grasshoppers, crickets, moths, flies and larger sap sucking insects saving you the trouble of catching them. 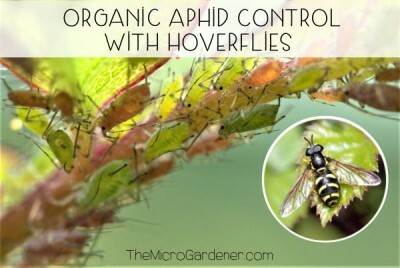 Hoverflies: Feed on flower nectar and will raise young (larvae) that have voracious appetites for a wide range of pests including aphids, thrips and other plant sucking insects. Yummy! Ladybirds (or ladybeetles) do an amazing vacuuming job of your aphids, mealybugs and scale population (eating 40-50/day and their larvae even more!) – It’s worth leaving them a sacrificial plant infested with aphids to keep them happy and hanging around to do more work for you. Damselflies: Much like their cousins the Dragonflies, they eat vast quantities of insects on the fly. Damselflies can consume their body weight in food in just half an hour – no mean feat! They are particularly fond of (caterpillar laying) moths and sap sucking aphids. Yay! 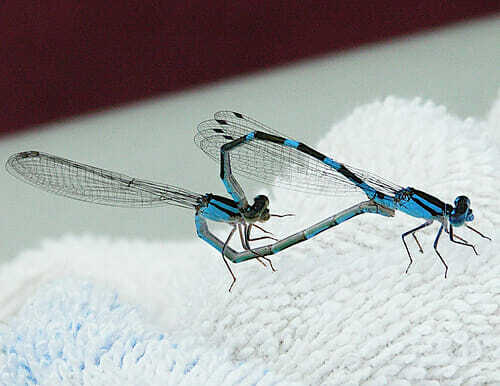 Besides, these beautiful insects are worth encouraging just to watch them making LOVE in their famous heart shape! Other beneficial insects you should welcome include spiders, assassin bugs, lacewings and parasitic wasps. Planting flowering shrubs and herbs in amongst your food crops will encourage these beneficials (like this Hover Fly) into your garden. We often focus on the ‘fruits’ of our labours in an edible garden, thinking about the harvest – the end result we can eat. However, there are a host of other beneficial pollinating insects who play a role in increasing our harvest considerably, with a little encouragement. Bees, wasps and butterflies play an incredibly important role in moving pollen from one flower to another, helping to pollinate our food crops as they eat their daily meals. 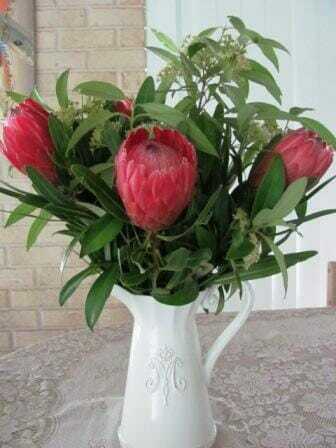 Provide them with a variety of flowering herbs and flowers. This will give beneficial insects a source of food and in return, they’ll help increase your yield with free pollination services. 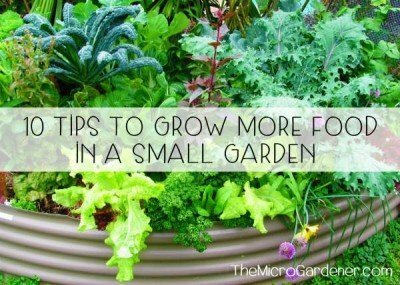 Grow some extra herbs and allow them to flower and go to seed (such as dill, coriander (cilantro), rocket (arugula), basil or other salvias, parsley, rosemary and chives. These flowering herbs in amongst my vegetables not only provide me with free seeds, but also help feed beneficial insects and confuse pests. Diversity makes it harder for them to find the scent and shape of the plant they are seeking. Using this technique can increase your harvest (by saving the seeds for future crops) and maximise the pollination of the food crops you are currently growing. 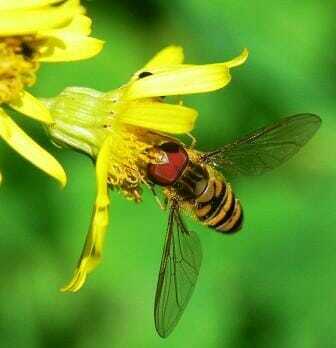 Just because you have flowers in your garden, don’t assume they will meet the needs of your beneficial insects. These proteas from my backyard are too large for tiny beneficials but the bees LOVE them and I often have to wait until they’ve had breakfast before I can cut a stem! The small creamy lemon myrtle flowers are more suitable for tiny pollinators. 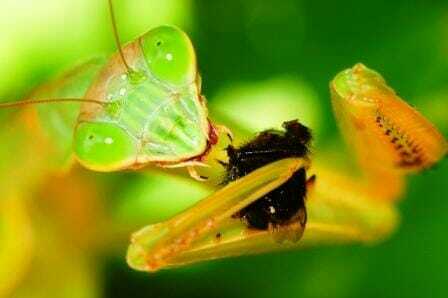 Because the majority of these insects are so tiny, they need to feed from small open shallow flowers. These are better than long deep flowers where they can drown in the nectar. Plant diversity = food (nectar, pollen, prey insects, berries and seeds for birds). 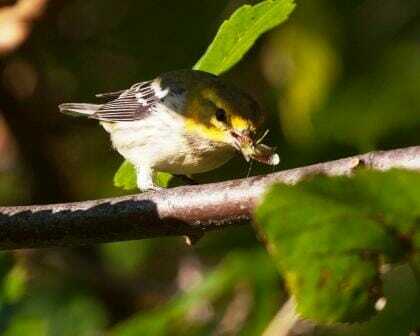 If a bird stops by to feed on seeds, they may well hang around for the insects too. Shelter (variety of plants and mulch) – these will also provide nesting materials for birds. Water (e.g. a fountain or large terracotta plant saucer) with 2-5cm of water in the bottom. Fill up with a few flat rocks/pebbles that rise above the surface for beneficials to land on. Encourage these beneficial insects and garden helpers to take up residence at your place. Simply avoid chemicals and grow flowering species. 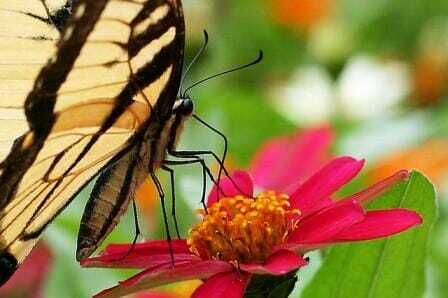 Fruit, berry, flower and seed bearing plants are all attractive to birds and butterflies who also help pollination. 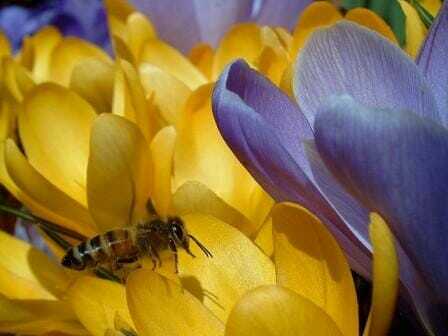 Flowers with nectar will attract many beneficial insects. Here are a few to get started: Basil, Chervil, Coriander (cilantro), Dill, Caraway, Echinacea (coneflowers), Fennel, Coreopsis, Sunflowers, Lovage, Borage, Feverfew, Millet, Sweet Alyssum, Parsley, Calendula, Cosmos, Queen Anne’s lace, Yarrow, Black-eyed Susan and Tansy or learn more about beneficial herbs you can grow. I’d also encourage you to plant some natives to your area. Related: Coping with Caterpillars Part 1 and Coping with Caterpillars Part 2. © Copyright Anne Gibson, The Micro Gardener 2016. https://themicrogardener.com. All rights reserved. Why are Ants in my Plants, Pots and Soil? Thankyou for my first newsletter. LOVED IT! Do I need to register again to get future newsletters? Welcome Margaret! So happy to hear you enjoyed your first newsletter. Now you’re a subscriber, you’ll keep getting all future newsletters with lots of tips I don’t share online. Enjoy! Hi Annie, what an amazing post! Your photos are also amazing and make your blog as much about the precious information that you give us on a regular basis as eye candy for those of us who relish our beneficials. I whole heartedly agree with you regarding allowing nature to come into its own cycles to manage pests. We had a brief touchdown in the world of sustainability in our Horticulture certificates but apart from that it was “Pesticides all round!”. We did get taught, however, to start with the soft option and the softest option for our environment is no chemical use at all. Nature has been dealing with these pest “problems” for millenia and it is only a recent phenomenon that we need to introduce man made chemicals into the equation. Massive monocrops gave pest species a great start to reproduce exponentially and are not conducive to natural cycles. Chemical companies support this massive crop production as a means to their end. Like Annie, I have the utmost suspicion about anyone telling me that I “must!” use chemicals to manage my “problem”. I too agree that a problem in one sense is a godsend in another. Our aphid infestation is the glut that allows our native wrens to prosper. The snails that invade our garden and more importantly the enormous slugs that dive in for a quick snack are dispatched as soon as they are noticed by the ducks. Our hens clean out large areas of weeds, eating those that they find palatable and scratching up all the rest leaving a nice evenly spread carpet of mulch to protect the ground. We had an outbreak of Cape Gooseberries as a result of the native birds spreading the seed from a large overgrown specimen near the gate. This plant is a win win “weed” all round. Its leaves are large, green and tasty to the hens and the ducks and its fruit is sought out eagerly by the native birds, the hens, the ducks and me! High in vitamin C and quite tasty when ripe, the plant fruits right through late spring, summer and early autumn and can be repeat harvested by all, keeping this “weed” in check. Lizards abound and they feed on insects, especially flies and the native predator birds feed on them. It’s one great big happy cycle of feeding around here on Serendipity Farm and its all thanks to us leaving it the heck alone! I must admit, apart from wanting our property to be chemical free, most of the weeds have not been dealt with because we have been somewhat slack lately but it is curious that those weeds are starting to be dealt with by other means. It is funny how the blackberry bushes are starting to succumb to rust and the hens are eating all of the fruit (that I don’t collect to make wine…) so there goes their seed bank in the ground. There are little insects everywhere eating leaves, being eaten themselves by hens, other insects etc. We have European wasps but you wouldn’t know it. They do their own thing and don’t seem to hurt anyone and are themselves predated by several larger birds. Everyone shares the water bowls, native birds and insect life alike and then head off for round 2 of the day. I am constantly amazed at how nature sorts itself out. My friend had a massive great outbreak of green vegetable bugs in her veggie garden. She didn’t want to use the chemicals that our lecturer told her to use so she decided to let her hens into her enclosed veggie garden and goodbye green vegetable bugs! They didn’t even get time to reproduce because the hens paid short shift to them before they were ready to do so. Chemicals are there because some massive great corporation (most probably Monsanto) is pushing them at very high levels. They want us to all think that we can’t do without them because their massive profits depend on us taking the “quick fix” and knocking our “pests” out with poison. We are not only killing our pests, we are killing their predators, our bees who are having a really tough time as it is at the moment and that are more vitally important to our ongoing existence than most of us know. 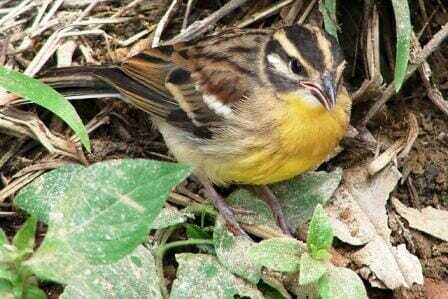 We are killing our native birds who feed on these poisoned insects and pass this poison through the food chain and ultimately we are killing ourselves. Nature will sort out your insect problems. You might have a few holes in your leaves, the odd aphid waving its little legs at you in greeting on your roses, you might get the odd outbreak and even a reasonably large breakout (like we recently did with harlequin bugs) but just around the corner there is a predator just waiting to take advantage of this sudden bonus and just watch…they will deal with it. Thanks so much Fran for so eloquently summing up EXACTLY how I feel! Couldn’t have said it better … perhaps you had better write my next post??!! I really appreciate you sharing the practical side of how you are imitating nature at your place in so many examples – when we step back and allow nature to correct the imbalances, most of the time that’s exactly what happens. On the rare occasions I’ve had to take alternative actions to save a crop, it’s been a last ditch measure because the ‘problem’ was my fault in the first place. My management practices led to an imbalance and this is how I’ve learned to work with what my plants need and not interfere most of the time. Worst case, mistakes can always be composted! An occasional tweak is necessary now and then, if natural predators haven’t appeared to take care of things but I have natural strategies for these times as well. I don’t want my backyard to become a graveyard for any species. I think it makes us better gardeners and custodians of our space by applying a ‘Work with nature” philosophy. What do others think?